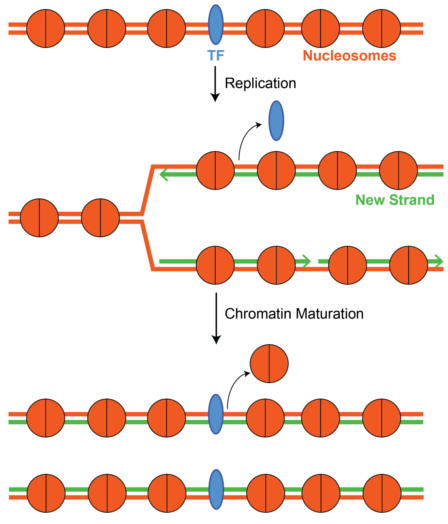 Schematic of chromatin maturation during replication. Passage of the replication fork (newly replicated DNA in green) displaces transcription factors (TFs; blue ovals). Maturation of the nucleosome landscape involves competition between TFs and nucleosomes (orange circles). Image provided by Dr. Srinivas Ramachandran. An oft-cited science tidbit is that each of our cells house roughly six feet of DNA, which have to be packaged inside a cell that is more than two thousand times smaller. This incredible feat is possible in part because of the nucleosome, a complex composed of eight histone proteins that wrap approximately 150 base pairs (bps) of DNA into a tidy package. However, when the DNA replicates during each cell division, every nucleosome has to be disassembled prior to replication and reassembled when the replication fork, a structure formed by the replication machinery, passes. It had long been assumed that nucleosomes are deposited at the same positions shortly after replication, but direct experimental evidence for this was lacking due to technical challenges of genome-wide mapping of nucleosome positions in newly replicated DNA. A new Fred Hutch study from Steven Henikoff’s Laboratory (Basic Sciences Division) spearheaded by post-doctoral fellow Dr. Srinivas Ramachandran and published in Cell, overcame these challenges by developing a new method, Mapping In vivo Nascent Chromatin with EdU and sequencing (MINCE-seq), that directly captures newly replicated DNA from asynchronous cells. MINCE-seq works by pulsing cultured Drosophila cells with the nucleotide analogue ethynyl deoxyuridine (EdU). The EdU-labeled DNA is then coupled to biotin in vitro and Micrococcal nuclease (MNase) treatment is performed to recover DNA fragments bound by either nucleosomes (147bp) or transcription factors (<50bp). Such fragments can be extracted with streptavidin and subsequently sequenced, which allows the newly replicated chromatin to be mapped with single base pair resolution. To validate MINCE-seq, the authors compared their input data with published data that mapped binding sites of replication (ORC), nucleosome (H2AZ) and transcription factor (GAF) proteins. Strikingly, MINCE-seq revealed that the nucleosome pattern is reset after replication, including nucleosome gain at nucleosome-depleted regions (NDRs; at promoters) whereas the ordered array of nucleosomes at gene bodies was weakened. By performing MINCE-seq in two types of Drosophila cells (S2 and BG3), the investigators found that nucleosome gains at NDRs only occur in cells wherein the cognate gene is expressed. Next, the scientists addressed the role of the replication-coupled nucleosome assembly pathway by depleting a subunit of the Caf1 complex (Caf1-105). MINCE-seq profiles in Caf1-105 knockdown cells showed that the resetting of the nucleosome profile at both expressed and non-expressed genes requires Caf1. Nucleosome loss and gain were found to correlate with promoter enrichment of RNA polymerase II and transcription factors (TFs), respectively, and the chromatin remodeler BRM was found to correlate with a subset of promoters that were grouped based on observed patterns of nucleosome gains. Finally, cell-type-specific enrichment of small protected DNA fragments (<50) at enhancers were seen, and MINCE-seq revealed that while this enrichment was lost during replication, broadly-acting enhancers recovered one hour post-replication, whereas cell-type-specific enhancers did not. Said Dr. Ramachandran "Based on high affinity of TFs to DNA and the difficulty in wrapping ~150 bp of DNA around the histones to make the nucleosomes, it was assumed that TFs would come back onto the newly replicated DNA first and they would set the barriers around which nucleosomes could be organized. But, no one had looked at nucleosome/TFs competition behind the fork directly due to challenges in isolating nascent chromatin at high temporal and spatial resolution. MINCE-seq enabled us to directly look at newly assembled chromatin. To our surprise, it was nucleosomes that competed out TFs after replication. I can speculate that during replication, nucleosome assembly likely protects the genome by ensuring a uniform deposition of nucleosomes. This way, spurious binding sites for TFs would be blocked. Only those sites at which the TF by itself can compete away the nucleosomes get exposed over time, leading to the chromatin landscape characteristic of the cell type." In summary, an innovative technique, MINCE-seq, allows newly replicated and maturing nucleosome profiles to be mapped with high spatio-temporal resolution, which revealed that the nucleosome landscape is reset by the replication-coupled assembly pathway and that maturation of this landscape involves competition between nucleosomes and TFs. Funding for this work was provided by the National Institutes of Health and the Howard Hughes Medical Institute.